Light up blacklight inks and posters with this unique Unfiltered Blacklight Strobe Kit (great for Halloween effects). Uses 3 large (10mm) UV LEDs that flash at a rate adjustable from about 80 up to 300 flashes per minute. In a darkened room the output is amazing. 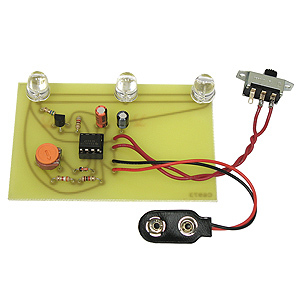 Operates from one 9V battery (not included) and features an IC circuit with "on board" adjustable speed control. Size of PC board 3 3/8" x 2 1/4". Complete with all parts, PC board and instructions. Skill Level 2.